The petit fours, mignardises, or anything mini that is sweet and to die for has always piqued my interest. A little morsel of sweetness while not feeling the guilt of a huge slice of cake; the ability to pick and choose between different flavors, colors and decorations brings the child out in me. Who could resist that child like excitement? The whole idea is enveloped in the notion of play time and illusion. 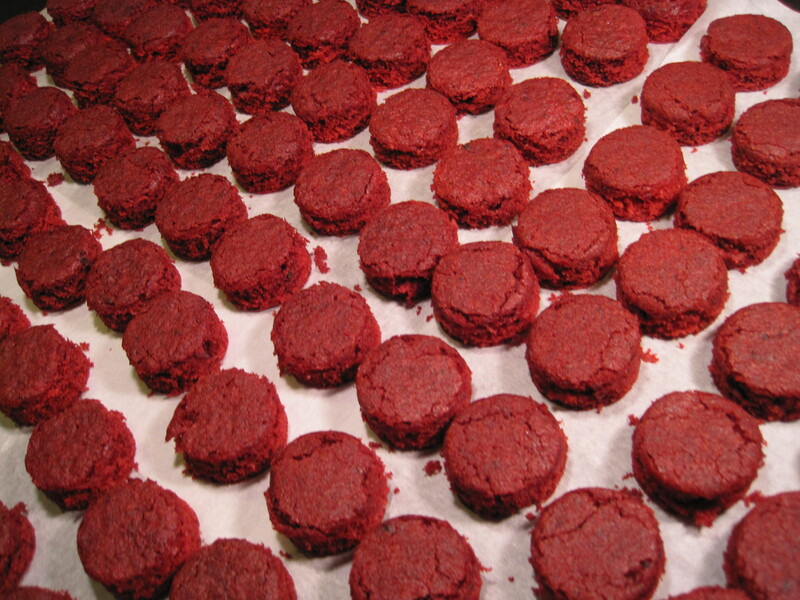 Those of you who recently read our first post (The First of Many Red Velvets) may have found yourself wondering, “What did they do with the centers of the cupcakes?” – and if you haven’t, I bet you are now. Well we had several ideas about how we could utilize these bite-sized cupcake centers including using them as little top hats on the cupcakes. But we ultimately decided on using them to make cupcake “sandwiches”, or what I would like to call them Morsels of Yummy Sweetness! For those of you who are not familiar with Petit Fours (“small oven” in french) they are small sweets generally eaten at the end of a meal with coffee. There are various kinds of petit fours however including dry (secs), iced (glacés) and salted (salés). Sometimes in french bakeries “mignardises” is used to refer to small desserts, while “petit four” is used to refer to hard buttery biscuits. Well we didn’t quite make Petit Fours, (but I see them in the Bake 2 the Future’s future), we’ve stumbled upon a great way to not let anything go to waste. We took the cupcake centers and dunked the rounded edge in the glaze and transferred them to a parchment lined baking sheet while the chocolate glaze set (ok we cheated and put them in the freezer for 5 minutes, shhh). We then removed a little bit off the bottoms to make them smaller (they made a tasty snack!) 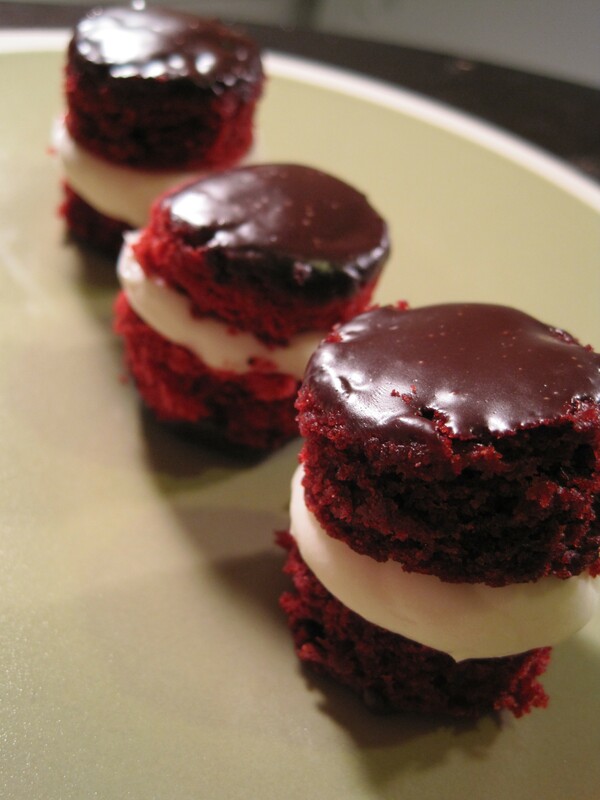 and sandwiched them together with cream cheese icing using our pastry bag. The results were scrumptious little cupcake bites that went instantaneously at the Birthday Party! People were so thrilled with them that they started making suggestions of other little bite recipes we may try in the future. We started to experiment with ways that we could produce these little bites while skipping the cupcakes. 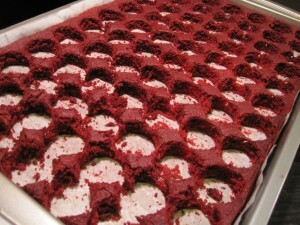 So in the experimental mind frame we went ahead and altered our original red velvet cake recipe. Although extremely delish’ the cupcakes left a little grease ring on the plates … not so appetizing. So we cut the canola oil in half and added shortening (1 cup oil and 1 cup shortening). We then dipped in the glaze… Side note we altered our original recipe by adding double the about of chocolate and increasing the amount of cognac to 1 1/2 tablespoons. 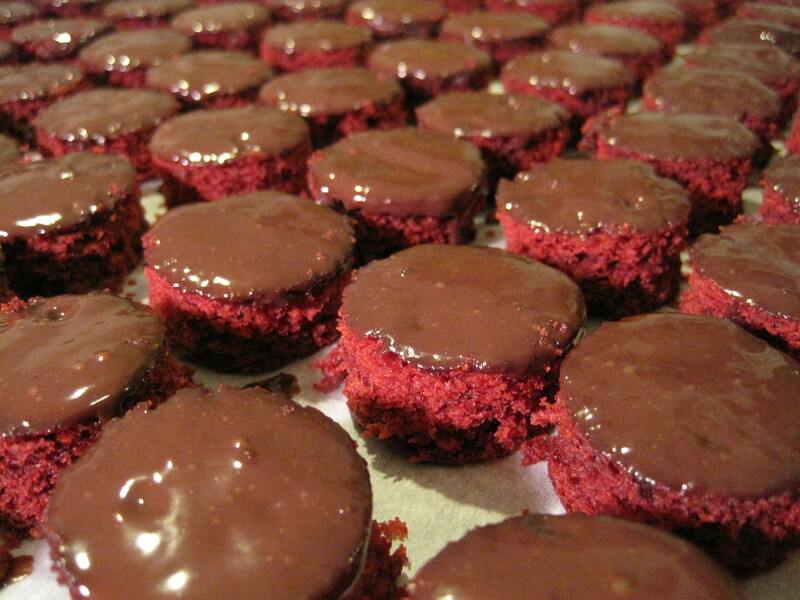 While creating a harder ganache layer it was a little to thick for our crumbling velvet bites. After the ganache hardened we used a pastry bag to add our Cream Cheese Frosting and sandwiched two bites together. 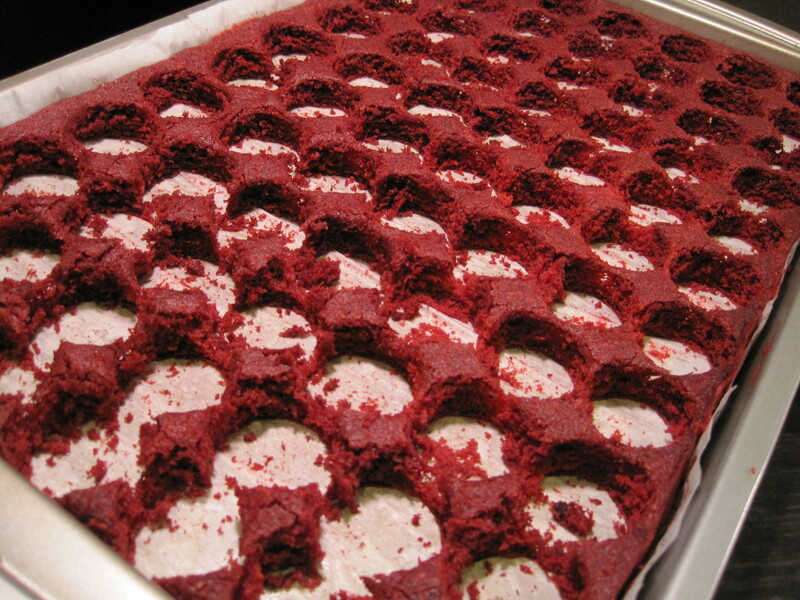 For a closing thought, the red velvet was a little more crumbly and dry than the original recipe and still left a little oil in the cupcake pan. Our conclusion; we would rather be left with the oil ring than a crumbly bite. But we are not deterred from this mini concept, which we anticipate visiting again soon! So [your husband] brought in these amazing cup cake bites to [work] today. 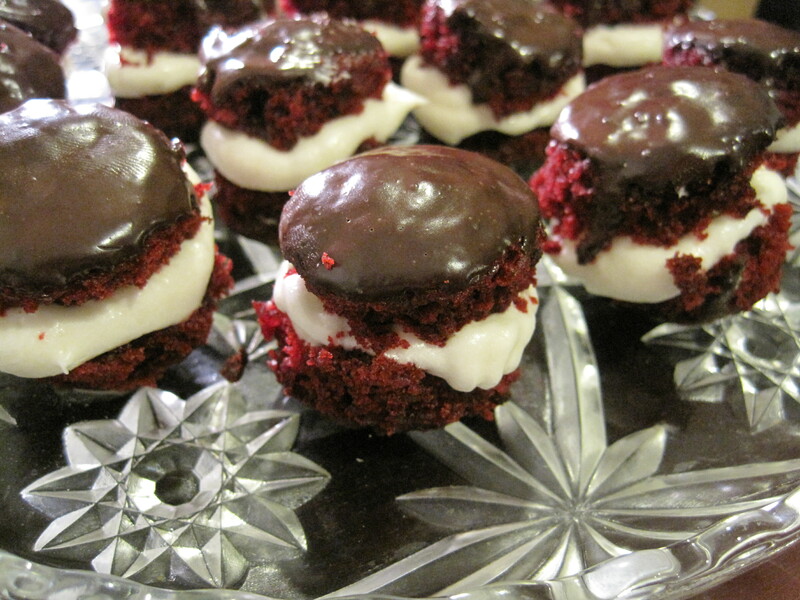 First of all, I don’t even like Red Velvet cake or cream cheese frosting but these bites were the bomb! Future suggestion for snacks at [work], anything to do with white chocolate mousse. Keep up the good work ladies.